A moment of sudden revelation or a manifestation of a divine being. A collaborative enterprise designed to achieve a particular aim. New World Folk ensemble Epiphany Project’s unearthly melodies, world music grooves, thought-provoking lyrics and virtuosic improvisations reach across time and geography. Bet Williams fearless stage presence and four octave vocal range, Hodian’s lyrical piano improvisations and Mal Stein’s cross-cultural rhythms create a transcendent musical experience. At the heart of each Epiphany Project concert is the act of being in the moment and a search for what is rare and ecstatic in life. Since 2003, John and Bet have traveled throughout Europe and the Middle East gathering sacred and secular texts in Aramaic, Sanskrit, Armenian, Farsi, Swahili and Welsh. 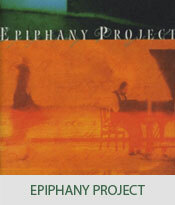 With influences ranging from Armenian Spiritual music, minimalism, Appalachian Folk, Jazz, Qawwali devotional songs, acoustic blues and Tuvan throat singing, Epiphany Project creates music that is heady but accessible. The latest CD, "The Poet and the Revolution" is finally available in the U.S. at all shows and also at CD Baby. Hear songs from "The Poet and the Revolution".